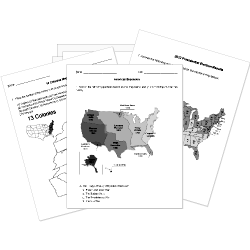 You can create printable tests and worksheets from these Grade 8 American Revolution questions! Select one or more questions using the checkboxes above each question. Then click the add selected questions to a test button before moving to another page. which country was NOT an ally of the colonists? Which state declared the British laws "null and void" and declared themselves free from tyranny in 1775? Which treaty ended the American Revolutionary War? Written by Thomas Jefferson, this document cut ties between America and Great Britain and listed the numerous reasons justifying doing so. Which of these resolved the conflict between the two plans of government proposed during the Constitutional Convention? Trapped between the American Continental Army and the French fleet the final British defeat came at which battle? What is the name of the document that ended the American Revolution and granted the United States all territory held by Great Britain in America below Canada? Thomas Jefferson borrowed ideas from this person in writing the Declaration of Independence? George Washington and his Continental Army came closest to defeat at which event? Developed by the Natives and used by the Americans these types of tactics emphasize hit-and-run staying on the move to keep your opponent off balance. Who was the leader of the British army in the South during the American Revolution? What was the first capitol of the United States? Which founding father wrote the majority of the Declaration of Independence? Why did they want to declare independence? They felt like they were being treated fairly. They wanted to be allies with Britain. They were being treated unfairly. They did not want to make their own decisions.